Cardinal Resources Limited (ASX/TSX: CDV) (“Cardinal” or “the Company” – http://www.commodity-tv.net/c/search_adv/?v=298369) is pleased to announce further shallow gold intersections to the exploration drill results previously announced on 16 July 2018 from its new Ndongo East discovery on the Ndongo License. The Ndongo East prospect is located approximately 20km north of the Company’s Namdini Gold Project which has a 6.5Moz Indicated Mineral Resource. “These latest shallow, significant gold intersections have provided a possible threefold extension to the original 400m strike length discovery zone to 1.2km in length. “The Ndongo East prospect lies within a larger target area of approximately 7km in strike length which has yet to be RC drill tested. “We are increasingly encouraged at how Ndongo East is evolving with the potential to add high-grade gold ounces to our 6.5Moz Namdini Gold Project located only 20km to the south and we expect the recommencement of the drilling as soon as possible after the wet season ends during October-November 2018”. The Ndongo Prospecting License covers an area of 295km2, having been expanded by the purchase of two exploration license areas from Kinross Gold in August 2017 (Figure 1). 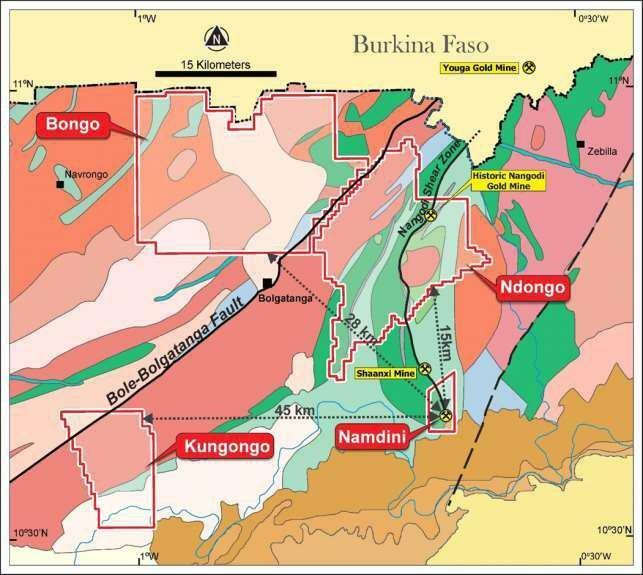 The license area is considered highly prospective for the discovery of economic gold mineralisation associated with the prolific Nangodi Shear Zone, a splay fault off the main regional-scale Bole-Bolgatanga Shear. The Nangodi Shear Zone is spatially related to no fewer than four significant gold discoveries, including the Company’s Namdini Gold Project with 6.5Moz Indicated Mineral Resource, the Shaanxi Gold Mine, the historic Nangodi Gold Mine and the Youga Gold Mine in Burkina Faso, adjacent to the Ghana border. In addition, there are numerous historic shallow artisanal workings along many parts of this shear zone including the Dusi, Zug and McGuiness Prospects which all fall within Cardinal’s license area (Figure 2). The Ndongo East Prospect is located within NE-SW trending Birimian metavolcanics and metasediments. Previously announced drilling intersected higher-grade gold mineralised structures concentrated in the northern portion of the shear zone over a 400m strike length on coincident gold-in-soil and geophysical targets (refer to Cardinal’s ASX/TSX announcement 16 July 2018 “Cardinal Makes New Gold Discovery at Ndongo”). Cardinal’s most recent RC drilling along fence lines to test mineralisation further to the southwest along strike and at depth has proven encouraging as further significant intercepts within the mineralised structures suggest mineralisation continues. The furthest drill fence to the southwest intercepted a narrow zone of mineralisation of 2m grading 27.0 g/t Au from 10m downhole in NDRC247 which indicates a strike potential of up to 1.2km of mineralised structures (Figure 3 and 5). Further infill drilling is planned to test this extended zone. Drill Section E – E¹ is typical of the intersections encountered during the RC drilling, with gold mineralisation developed at, or near, the diorite-granodiorite contacts where competency differences create brittle fracturing which allows the ingress and precipitation of mineralising fluids (Figure 4). The mineralised horizons contain variable chlorite-silica-carbonate-sericite alteration with sulphides (mainly pyrite with very minor arsenopyrite). The mineralised system is open along a northwest-southeast strike and at depth with multiple mineralised intersections (Figure 5 and Table 2). We expect to recommence drilling after the wet season during October-November 2018 in order to test the strike and depth extents of the mineralised system. Cardinal Resources Limited (ASX/TSX: CDV) is a gold-focused exploration and development Company which holds interests in tenements within Ghana, West Africa. The Company’s Namdini Project has an Indicated Mineral Resource of 6.5Moz of gold contained in 180Mt at 1.1 g/t Au at a cut-off of 0.5 g/t Au and an Inferred Mineral Resource of 0.5Moz of gold contained in 13Mt @ 1.2 g/t Au at a cut-off of 0.5g/t Au. The Company is focused on the development of the Namdini Project through advancing its PFS studies as well as gold exploration on its tenements located within close proximity to the Namdini Project.